A solitary pulmonary nodule (SPN) is defined as an isolated, well-circumscribed, opacity on imaging that is 3 cm in diameter or less and is encapsulated by normal lung tissue.1 If the lesion is greater than 3 cm in size, then it is considered a lung mass. As you can imagine, the larger the size of a nodule, then higher the risk of malignancy. Around 80 percent of nodules greater than 2 cm in size are malignant, whereas only around one percent of nodules that are 5 mm or less are malignant. Nodules that are malignant typically will double in size within a 12 to 13-month time period. If a solid solitary pulmonary nodule remains the same size over a two-year period, then it is believed to be benign in most instances.1 Nodules that are ground glass in appearance on imaging typically will have a longer duration for follow up since this type of pulmonary nodule has a longer doubling rate. The likelihood of malignancy is higher in spiculated nodules, lesion identified in the upper lobes of the lungs, and lesions that are asymmetrically calcified. Whereas, the likelihood of malignancy is lower in nodules that have a central location, uniform calcification, and have smooth borders. 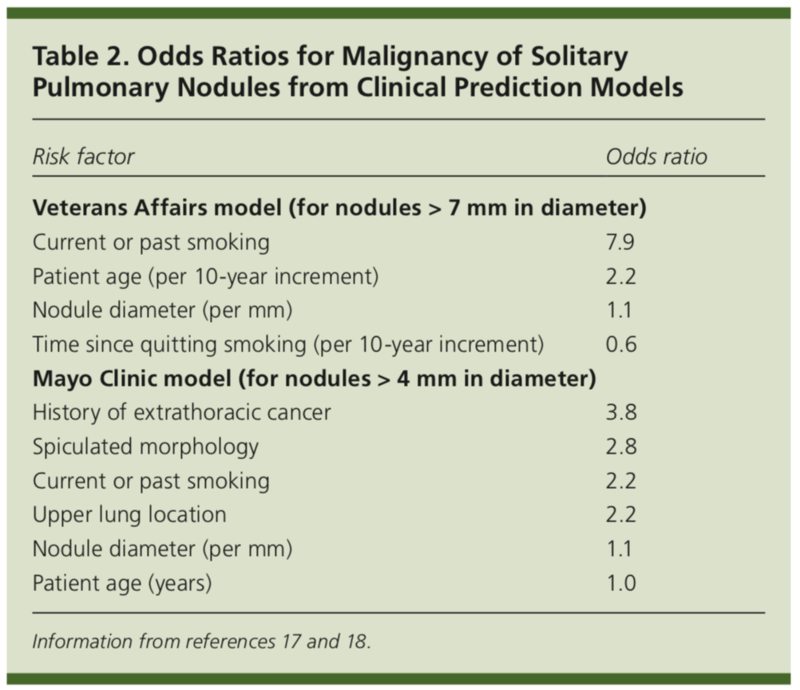 Another way to differentiate the risk of malignancy of a solitary pulmonary nodule is based on if it is solid or subsolid. Solid nodules are more commonly seen but are less likely to be malignant. Subsolid nodules are more likely to be malignant. Subsolid nodules are further broken down into ground-glass nodules and part-solid nodules. The first thing that comes to mind when a pulmonary nodule is seen is cancer, and rightfully so. However, there are numerous causes of a solitary pulmonary nodule such as infectious granuloma, hamartoma, intrapulmonary lymph node, or sarcoidosis. Infectious granuloma are over 80 percent of cases and are further broken down into coccidioidomycosis, atypical mycobacteria, tuberculosis, or histoplasmosis. Quantitative predictive calculators use both clinical and radiologic features to estimate the likelihood of malignancy. The most commonly used model from Mayo Clinic uses six categories to estimate the probability of malignancy. These include age, smoking history, the diameter of the nodule, history of extrathoracic cancer more than five years prior to nodule detection, location in the lung, and if spiculation presence. Imaging is crucial in the long-term evaluation of a pulmonary nodule. It is essential that when a pulmonary nodule is found that you trace back into the patient’s chart to see if this was present on past imaging and if the size is changing over time. Some nodules are visible on chest radiograph, even down to 5 to 6 mm in size. Regardless of with what modality that the nodule is found, the next step is to get a CT of the chest, which is more specific and more sensitive than the chest radiograph. In addition, the Chest CT can give a specific location, size, and characteristics of the nodule. CT imaging of the chest is also used for follow up imaging as well. 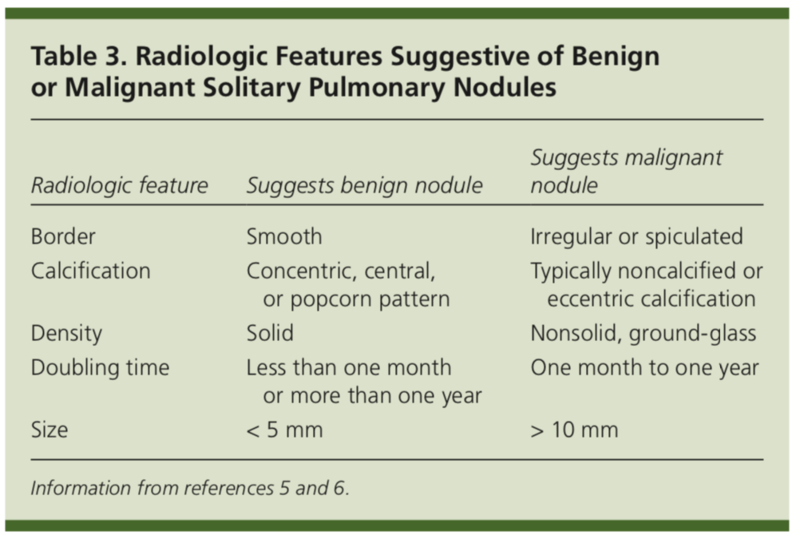 Features of a pulmonary nodule including the borders, calcification, density, rate of growth, and size can be helpful in aiding to determine the likelihood of malignancy. Am Fam Physician. 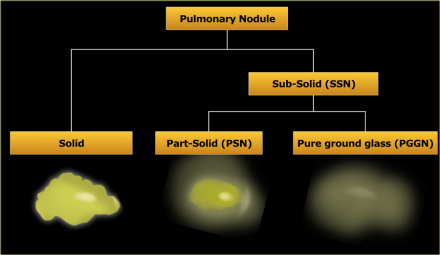 Evaluation of the Solitary Pulmonary Nodule. 2015;92(12):1084-1091. Copyright © 2015 American Academy of Family Physicians. If there are concerning characteristics on the CT scan of malignancy, the radiologist might next recommended getting a PET scan. A PET scan aids in differentiating a malignant from benign nodule based upon the metabolic activity of the area in question, with an increased metabolic activity typically being found in malignant nodules. 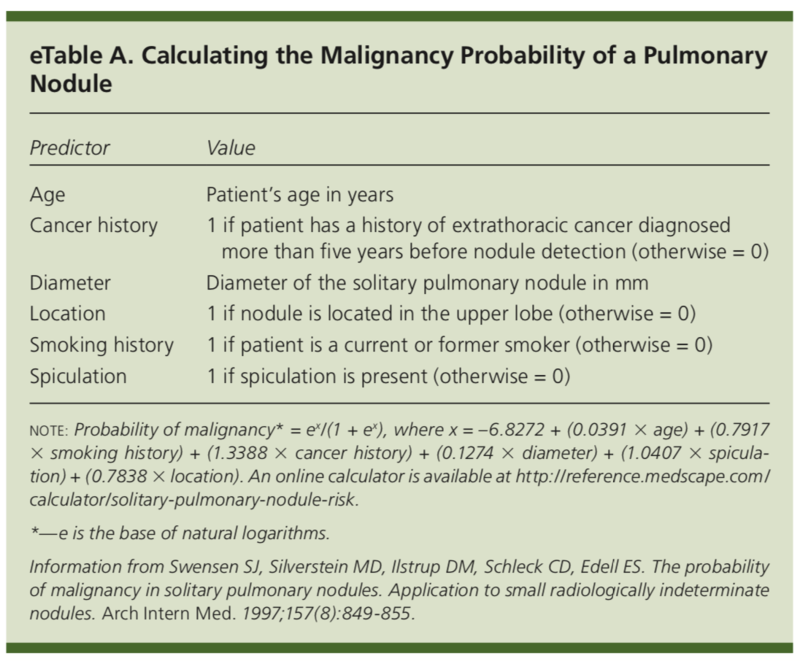 For a single solitary pulmonary nodule that is less than 6 mm, we first start off by calculating the probability of malignancy. Low-risk nodules (5 to 65 percent) should have no routine follow up. High-risk nodules (greater than 65 percent) may have an optional CT scan done at 12 months. For single nodules that are 6 to 8 mm in size that are low risk, a CT scan should be done at 6 to 12 months, then consideration of a repeat CT scan in 18 to 24 months. High-risk nodules of the same size should also have a repeat CT scan done at 6 to 12 months, and then a recommended repeat CT scan at 18 to 24 months. For single nodules that are greater than 8 mm in size that are at low risk for malignancy, a CT scan should be done at three months. Consideration of PET scan or tissue sampling should be taken dependent on size, characteristics, and risk factors. For nodules that are greater than 8 mm in size that are at high risk for malignancy, the same recommendation as low-risk holds true. If there are multiple solid pulmonary nodules noted on CT imaging that are low risk and less than 6 mm in size, no further follow-up is needed. If multiple nodules are high risk and are less than 6 mm in size, then an optional repeat CT can be done at 12 months. If multiple nodules are low risk and 6 to 8 mm in size then a repeat CT should be done at 3 to 6 months, then consideration of a CT scan at 18 to 24 months. If multiple nodules are high risk and 6 to 8 mm in size then a repeat CT should be done at 3 to 6 months, then another CT scan at 18 to 24 months. If multiple low-risk solid nodules are seen that are greater than 8 mm in size a CT scan at 3 to 6 months should be completed, then consideration of a repeat CT scan at 18 to 24 months. If multiple high-risk solid nodules are seen that are greater than 8 mm in size a CT scan at 3 to 6 months should be completed, then again at 18 to 24 months. 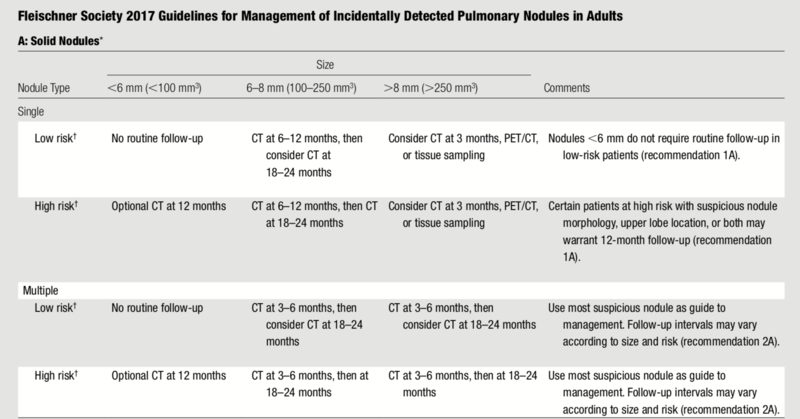 Fleischner Society Guideline Update: Management of Solid Pulmonary Nodules. 2017. https://pulmccm.org/review-articles/fleischner-society-guideline-update-2017/. Accessed: July 9, 2018. 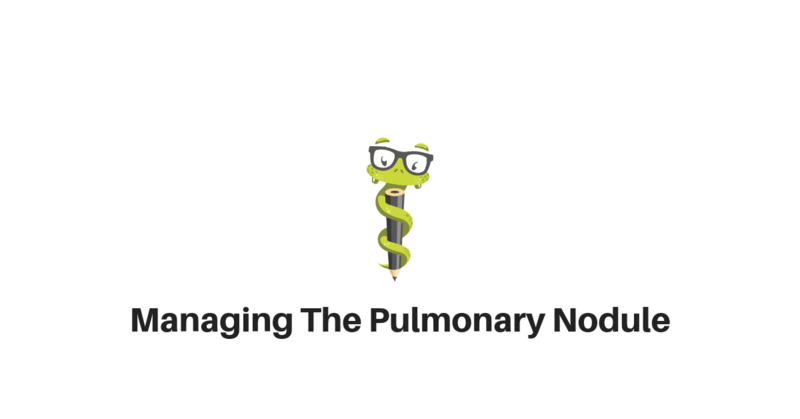 Lastly, the management of subsolid pulmonary nodules. If there is a single nodule and it is less than 6 mm in size, no further imaging is indicated. If the nodule is ground glass in appearance and greater than or equal to 6 mm in size a repeat scan should be done in 6 to 12 months, then every two years until five years. If the nodule is part-solid and greater than or equal to 6 mm in size, then a repeat CT should be done in 3 to 6 months and then annually for five years as long as the solid component remains less than 6 mm in size. If there are multiple subsolid nodules noted on imaging that are less than 6 mm in size, a CT scan should be completed again at 3 to 6 months. If stable, consideration of a repeat CT scan should be done at two and four years. If there are multiple subsolid nodules seen on imaging that are greater than 6 mm in size, a CT scan should be done again in 3 to 6 months. Further imaging or tissue sampling should be considered based on the most worrisome nodule on previous imaging. CaptionFleischner Society Guideline Update: Management of Solid Pulmonary Nodules. 2017. https://pulmccm.org/review-articles/fleischner-society-guideline-update-2017/. Accessed: July 9, 2018. The choice of tissue sampling in all cases of pulmonary nodules is based upon the size and location of the lesion. If the lesion is large in size and centrally located, an endoscopic biopsy is often used. If the lesion is peripherally located, then a transthoracic biopsy might be chosen. If a lesion needs to be biopsied through endoscopic techniques (bronchoscopy) or if you are unsure what next step to take, referral or consultation without pulmonology should be considered. Another option for tissue sampling would be referral to interventional radiology who can complete a fine needle aspiration or video-assisted thoracoscopic procedures depending on the characteristics of the lesion. USPSTF. Final Recommendation Statement: Lung Cancer Screening. https://www.uspreventiveservicestaskforce.org/Page/Document/RecommendationStatementFinal/lung-cancer-screening. Accessed: July 9, 2018. Guidelines for Management of Incidental Pulmonary Nodules Detected on CT Images from the Fleischner Society 2017. https://pubs.rsna.org/doi/pdf/10.1148/radiol.2017161659. Accessed: July 9, 2018.